Chinese scientists on Friday successfully tested the power system of a Long March-5 carrier rocket scheduled for flight in 2016. Development of the rocket, the fifth-generation launch vehicle of the Long March family, has entered a "runoff" phase, according to the State Administration of Science, Technology and Industry for National Defense. The rocket will have a payload capacity of 25 tonnes to low Earth orbits, or 14 tonnes to geostationary transfer orbit, about twice the current capacity. The would-be capacity will be equivalent to that of mainstream carrier rockets now in use around the world. The rocket will serve the final chapter of China's three-step -- orbiting, landing and returning -- lunar program and the building of manned space stations. The Long March rocket family has completed more than 200 missions since 1970, when a Long March-1 rocket sent China's first satellite, Dong Fang Hong 1, or "the East is Red", into Earth orbit. BEIJING, Chinese scientists on Monday successfully tested the power system of a Long March-5 carrier rocket scheduled to serve the Chang'e-5 lunar mission around 2017. Using non-toxic and non-polluting liquefied propellant, the engines of the rocket were fired on the ground. This final ground test of the power system was good preparation for tests on actually launching the rocket next year, said the State Administration of Science, Technology and Industry for National Defense. China successfully tested the power system of its Long March 5 carrier rocket on Monday. The test marks the completion of the manufacturing phase for the rocket. A final ground test for maybe the most powerful satellite launcher in the country. The massive rocket is 5 meters in diameter. That's equivalent to a 20-story building and it has a capacity much bigger than the current level. "The capacity of the Long March 5 is twice the current capacity. It reached 25 tons to low earth orbit or 14 tons to geostationary transfer orbit," Lou Luliang, associate engineer of Long March 5, CASC, said. That capacity is a key to serving the newest chapter in China's manned space station development. China is stepping up efforts on its manned space program and its ambitious plans include a permanent space station, manned lunar missions, and a possible manned mission to Mars. The new booster rocket will help to achieve that dream. Its major tasks include a lunar exploration mission and sending up the core cabin of a manned space station. The rocket will be able to carry heavier spacecraft into outer space than ever before but it will also adopt a more eco-friendly solution. 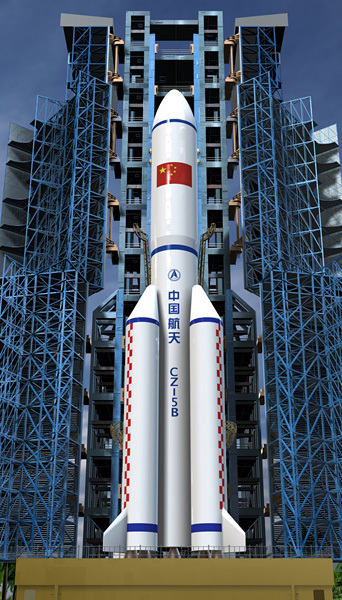 "The long march 5 is a giant rocket using non-toxic and non-polluting liquefied propellant. Its upcoming tasks include a lunar exploration project and a manned space station," Lou said. The largest-ever rocket will also help make space exploration a more economical venture. Its size will allow the new rocket to send both cargo spacecraft and satellites into space at the same time. "Our objective for the new carrier rocket is to reduce 20 to 30 percent of the cost when sending spacecraft into outer space" Yang Hujun, associate engineer of Long March 5, CASC, said. After finishing all of its ground tests, the Long March 5 will be shipped to Hainan for its launch scheduled in 2016.